April 8th, 2019 by Pamela V.
It’s the little details that sometimes are the most charming and the 2020 Jeep Gladiator camera can make all the difference when off-road. The backup camera comes standard, but Jeep is also offering a front-facing camera on the new Gladiator. As a driver, it’s about to get the best perspective while focusing on driving. If there is a good view of the road in your current car, this vehicle has a few surprises up its sleeve. Things might seem different on the off-road track. That’s because the wheels will be able to guide the car in the right direction of the destination. There’s a six-foot blind spot in most cars that obscures the path in front because of the hood of the car. Not that big of a deal if in the highway, but if trying to squeeze around tight trails between trees or rocks, then it becomes more difficult. It’s like that in most cars. Jeep responded by giving the Gladiator a front-facing camera. It’s an option, but an option that many wouldn’t mind spending the extra money on. The pricing is yet to be determined. It’s also one fun feature on the new truck. The camera will be just like a reversing camera on the rear of the modern vehicles. The Gladiator’s front camera is a wide-angle lens that beams a live view to the dashboard touchscreen. The vehicle is mounted in the center vane of the Jeep’s grille, a black plastic nodule that unifies for the most part with the mesh. The Gladiator’s UConnect infotainment touchscreen allows you to choose the front-facing camera view. It shows roughly two feet of the terrain ahead of the pickup. There are dynamic guidelines which will enable drivers to see where precisely the truck is aiming. There is also an integrated cleaning system included. When pushing the Gladiator hard off the pavement, it will get muddy, but the front-facing camera is in the perfect spot to get a liberal coating of grime. Not to worry, click the “Clean Camera” button on the touchscreen and the Jeep will spritz the lens with the same soapy water that’s in the windshield washer jets. Hold down the finger on the button, and it will continuously spray and loosen any particular stubborn dirt on the vehicle. The difference between this vehicle and others is how long it stays on. Unlike other surround-view cameras, Jeep’s front-facing camera stays on-screen for extended periods. All of the Gladiators have a blind-spot warning system and a backup camera. As an option, there are the adaptive cruise control and automatic emergency braking that buyers can choose from with some models. 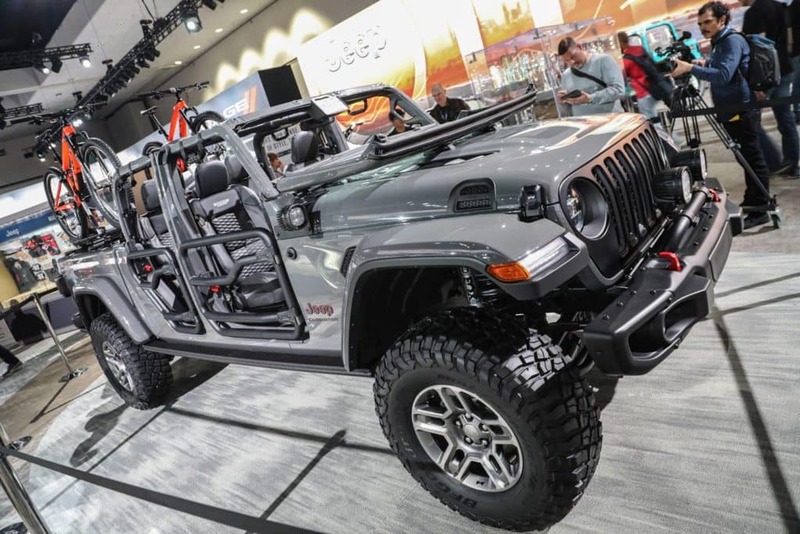 The cabin resembles the Wrangler’s with the waterproof start/stop button, Uconnect infotainment system, and the storage bins underneath the flip-up and foldable rear chairs. The 2020 Jeep Gladiator design aesthetic is immediately recognizable with its traditional Jeep design cues. The design team left the conventional seven-slot grille that’s seen on the Wrangler, but it widened the grille slots for additional air intake which will help with the assistance of increased towing capacity. To enhance aerodynamics, the top of the keystone-shaped is swept back. The Jeep models that offer the available LED headlamps and fog lamps are the Gladiator Overland and Rubicon, which add to the truck’s modern look. The Gladiator models come equipped with LEDs that feature daytime running lights, which form a halo around the outside perimeter of the headlights. The forward turn signals are located on the front of the trapezoidal wheel flares. There are traditional square tail lamps that feature available LED lighting, and it also has wide tailgate opening for unobstructed loading of cargo in the bed. The tailgate is competent in stopping in three positions, while the cargo is easily secured with a power-locking tailgate. The Gladiator’s interior combines authentic design, versatility, support, and instinctual feature use. Throughout the cabin are found high-quality materials and precision craftsmanship. The heritage-inspired center stack features a clean, sculpted form that complements the horizontal dashboard design, sporting a finished dictated by the model choice. You can search the inventory of Jeep’s at Hollywood Chrysler Jeep. Make sure to stop by for a test drive and see if this model and make is the car for you.